The Medi.SPA at ADVANCED is please to offer VISIA™ Digital Skin Analysis to our patients. This state-of-the-art system is an exciting technological innovation that uses a multi-spectral imaging system to identify problem areas of your complexion. With the detailed information we learn from your VISIA analysis we can design a customized skin treatment program that specifically targets these areas. 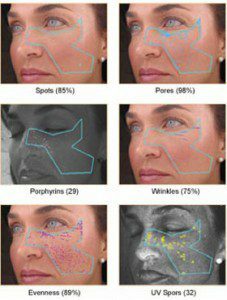 With this quantitative assessment of skin, we can customize treatment and skin care recommendations exclusively for you and with follow-up VISIA imaging we can track our success. We look forward to your personal VISIA consultation.